Billionaire financier and political activist George Soros said Germany should lead the European Union in a different direction, or be persuaded to leave the euro currency so other nations can move forward. "In my judgment the best course of action is to persuade Germany to choose between becoming a more benevolent hegemon or leaving the euro," Soros wrote in an essay published in the New York Review of Books Monday. "In other words, Germany must lead or leave." Soros said the EU is at risk of becoming permanently divided between debtor and creditor nations, a split that he says will ultimately lead to economic depression and social unrest. To prevent this, Soros argues that Germany should "level the playing field" for debtor nations by allowing them to refinance public debt at affordable rates. He also said that Germany should be willing to tolerate inflation rates above 2%, in order for the eurozone economy to grow again. Throughout the crisis, Germany has done the "minimum necessary" to prevent a break up of the euro currency union, but Soros says Germany needs to stop insisting that governments repay their debts at any cost. If Germany refuses to change course, Soros says the next best option is for other EU nations to convince Germany to leave the euro currency union, a move he says would be disruptive but will also set the stage for the remaining eurozone nations to recover. "It is Germany's fear of becoming the deep pocket for Europe that stands in the way," he stated. "Given the magnitude of Europe's problems this is understandable; but it does not justify a permanent division of the euro area into debtors and creditors." Soros argues that an exit by Germany would cause the euro to depreciate, which would lessen the debt burden and increase competitiveness for the remaining nations that use the single currency. In addition, Soros said the threat of default "would evaporate" with the European Central Bank under debtor nations' control. "Without Germany, the euro area would have no difficulty in carrying out the U-turn for which it would otherwise need Chancellor Merkel's consent," wrote Soros. By contrast, Soros said an exit by one or more debtor countries could cause the euro to collapse and send shock-waves throughout the global economy. "The common market and the European Union may be able to cope with the default of a small country such as Greece, especially when it is so widely anticipated, but it could not survive the departure of a larger country like Spain or Italy," he said. "Even a Greek default may prove fatal." However, Germany is unlikely to exit the currency union voluntarily. 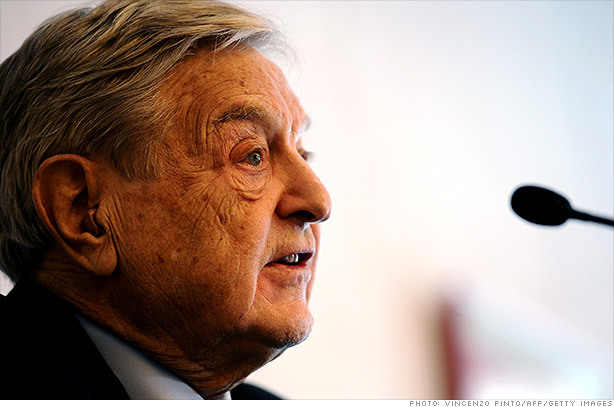 Other EU nations must push Germany to either change its policies or leave, according to Soros. He argued that France, the second-largest eurozone economy after Germany, should join forces with Spain and Italy to put pressure on Germany. Yet he acknowledged that France has limited room for maneuver given its own debt problems. "So France's real choice is, on the one hand, between breaking with Germany to save Europe and restore growth or, on the other, pretending to be in the hard currency boat for a limited time, only to be thrown overboard later," writes Soros. Soros said the new bond-buying program announced last week by the European Central Bank could reinforce the divide between creditor and debtor nations. The ECB said it is willing to make unlimited purchases of sovereign debt in the bond market for governments that agree to strict conditions. But the ECB's intervention will not eliminate risk premiums in the bond market, and the conditions will make it harder for governments to revive economic growth, according to Soros.